How can I reuse or recycle Keurig coffee K-cups? | How can I recycle this? 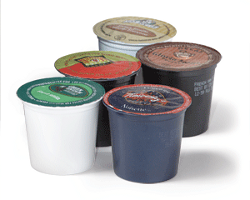 How can I reuse or recycle Keurig coffee K-cups? I love drinking the various flavors of Keurig coffee, but hate wasting the cups since they can’t be recycled I need suggestions on what to do. Kids crafts would be great since I have 2 little ones. I hadn’t heard of “K cups” or “Keurig coffee” before but Wikipedia tells me they’re a bit like a Nespresso machine – single use pods of coffee. As with the Nespresso ones, there are a few how-tos out there on refilling the cups to reuse them again. As far as I can see (someone please correct me if I’m wrong), the bottom of the cup is pierced during the coffee making process so that might get in the way of some reuses. From pictures on Google (btw, don’t Google Image search “k cup” unless you like pictures of boobies), I think they’re about 4-5cm in diameter and about the same tall. I’ve got a bit of a one track mind at the moment so can’t think of anything else other than using them for growing seedlings. Anyone else got any better suggestions? Especially kid-craft ones as Rose requested? I don’t think finding a way to repurpose those plastic cups would really compensate the huge amount of waste that gets generated when using coffee packaged that way. Each individual coffee cup produces a plastic cup of waste. One cup a day makes nearly 400 plastic cups in a year, 10 cups a day makes that nearly 4000 – 3 people drinking 3-4 cups each a day, that would be a realistic number. I’ve tried a few of those coffees at my friends who have one of those machines. But I would not get one of those for myself. Pick a nice roast of coffee, and use a classic Italian Moka type percolator, or a French press. It takes more than 30 seconds to make the coffee, but you get a tastier coffee, and you don’t get even paper filters in your waste (or the taste of paper filters in the coffee). Just a nice cup or three of coffee (use a small moka for one cup, or make less coffee in the French one – either way, no coffee wasted). All that you get as a byproduct is some clean coffee grinds for your plants, and an occasional nice package to use for crafts. By the way, I am picky about my coffees. When I moved from Italy to Spain, I was whining about the roast being different for the first 6 weeks until I found some Kimbo or Lavazza. Moka and French presso are the only coffee preparing devices I allow in the house. Once you get used to making your coffee in either way, it’s hard to not notice the paper flavor in the filter coffee. Maybe if the plastic of those K containers looks interesting, it could be used for some plastic beads or crafts, but that would still be a huge mountain of materials for the amount of coffee provided. Kids craft is a great option, Also the plant pot is a good suggestion. You could put them together and get your kids to paint the cups and plant their seeds in the pots. I believe you can purchase a reusable k cup for the Keurig machine. You refill it with coffee grinds that you already have. Make tiny freezer Popsicles with them for your kids, or use them to hold individual colors for painting projects, decorate them with paint and google eyes to make them look like animals or seasonal characters then fill them with tiny candies like kisses or mini m&ms (talk about limiting portion sizes for any calorie counters out there), make jello shots, make a clunky-chuncky plastic cup necklace as a craft project for toddler, start seedlings in them, decorate them with attractive fabric glued to the outside then use them as decorative chic covers for your Christmas or patio lights. ….pant…pant…whew! Is that enough projects for now??? they have holes in the bottom…not good for liquid. I am repurposing used K-Cups for starting seedlings. So far, the first to sprout is Kale in a decaf Folgers K-Cup. I have planted Kale in a bold Green Mountain cup, but it has yet to sprout. Since using coffee grinds is a common practice for some gardeners, I knew it would work. What a savings this could be for K-Cup coffee lovers who also garden!!! Once you pull the seedling from the cup, you can plant more seeds. I have photos. Use and then clean/dry the cups. They are just the right size for someone who makes crochet bells. You can place the bells on the upside-down cup to starch each bell. They are also great as a form in making wire jewelry. Make giant ice pieces in them for the bowl of drink at the party. They are making new recylable k-cups (you have to have the new machine) but all you do with these is take them apart, which you can do with the current k cups. As long as you are willing to take the time to take them apart there should not be any reason you cannot recycle them. I don’t fully know their size but since it sounds like they have a hole in the bottom you could take a bunch of them, glue them to an old plate or something and use it for paint tray, or you can separate beads in them. Depending on their size you can also glue them to a plate again and use it for a condiment holder for parties and stuff. You can make toys out of them for kids or grand kids. another party or agent to make you better equpped to pursue commercial real estate. Is the foil cover recyclable? Let kids plant beans in them. Place cotton ball in each, ad water, let them place seed in each and watch their own garden grow. It only takes few days for the beans to turn leaf.